This alliance of 10 area shop owners draws together a wide range of services and products. Step inside Pepper Road & Friends and find out more about this group of small antique, vintage and boutique shops. 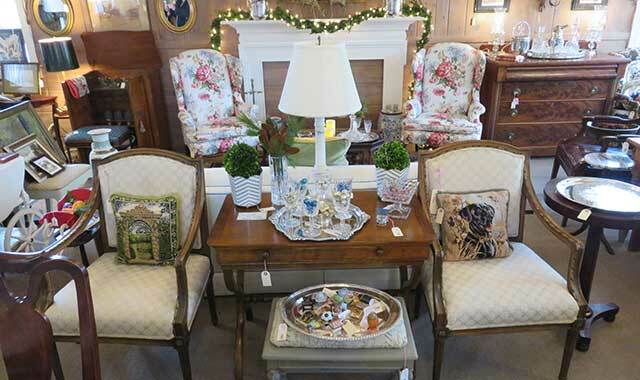 The English Daisy, in Barrington, specializes in pre-owned, high-quality furniture and home accessories. The consignment/resale store is one of 10 shops within the Pepper Road and Friends group of small antique, vintage and boutique shops. Four years ago, a group of antique/vintage/boutique shops located in a somewhat obscure industrial park of Lake Barrington banded together to form an unlikely partnership. They’re located mostly along Pepper Road, a short, mainly north-south thoroughfare that locals use as a shortcut between Kelsey Road and Route 14, and their owners host an annual Holiday Open House as a way to direct traffic to their individually thriving, yet “hidden gem” businesses. The group’s very first joint holiday event proved to be a success, with the shop owners eagerly cross-promoting each others’ assortments of one-of-a-kind goods. The owners of Julia and Friends, Junk Warehouse Etc., Tattered Tiques, Creative Resale Ltd. and Spruce soon after joined forces with other nearby shops that fit a repurposed/consignment/vintage profile. Lake Barrington Resale 4 Less (located a block over), The Pink Geranium and Company, Steeplechase Antiques, and The English Daisy of Barrington joined the effort. Just last year, The Winterberry Companies moved to Pepper Road and joined ranks with the group. The store had operated in Wheaton as JB Winterberry for nearly a decade before the owners took a break. Pepper Road and Friends now comprises 10 shops. Pepper Road and Friends now hosts an average of five collaborative events each season, including its Holiday Open House. There’s also a Girls Night Out in July, a Fall for Junk event in September, and a popular Vintage Spring Market that includes outside vendors, as well. Individually, each shop has a strong following, but cross-promotion via Facebook, Instagram and traditional news sources has helped group events to take off. It helps that each shop is so unique, even though they share the same genre. What’s more, the shop owners have bonded beyond business, says Ann Kyrk, who runs Creative Resale Ltd. with her mother, Sandy Breda, and sister Joy Prisching. Customers recognize the budding camaraderie, which feeds the fun that shoppers enjoys on Pepper Road and beyond. Pepper Road and Friends hosts its annual Holiday Open House Wednesday, Nov. 8, from 4 to 8 p.m., to launch its holiday season. Each store features special events; some shower customers with hors d’oeuvres and refreshments; others provide giveaways every hour; still others offer demonstrations. To learn more about the 10 antique, vintage, resale and consignment shops, visit pepperroadandfriends.com. This entry was posted on Friday, November 3rd, 2017 at 11:59 am	and is filed under Recreation & Destinations. You can follow any responses to this entry through the RSS 2.0 feed. Both comments and pings are currently closed.